We rocked Mobile World Congress in Barcelona. Pava the Parson got some well deserved media attention: Bloomberg, USA Today, Animal's Health. Here for you and your furry friend. 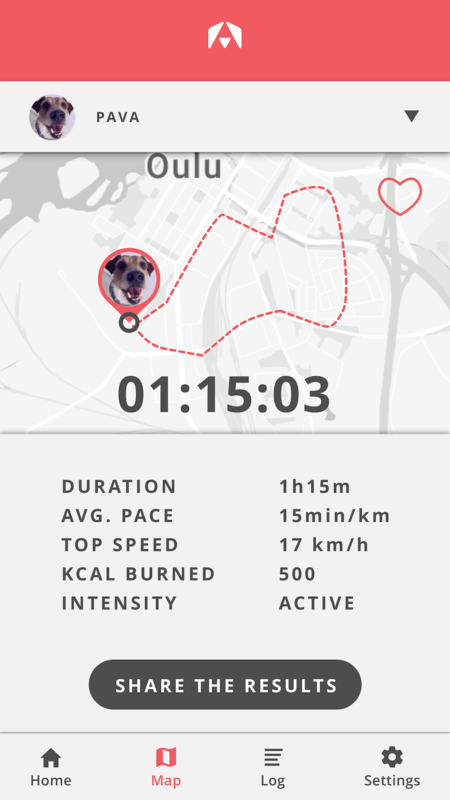 Ever wondered how much your dog runs around while you sweat in your jogging pants? By tracking routes, you'll see the path and distance they moved, with some key stats like their average heart rate. How do you make sure your dog gets the right amount of exercise? Set and track goals that suit your own buddy. As you keep tracking activity over longer periods of time, the app will be able to dig deeper into insights. Get more objective data, information, insights about your dog. With a powerful and easy to use Anaxeos App,dog owners get more out of the shared moments and life with their dogs. Get your hands on one. The Anaxeos sensor pack is around 48 grams of magic (40mm*85mm). It holds five sensors and a GPS transmitter, to enable collecting important information on your dog. Data is transformed into insights, tips and alerts in the Anaxeos cloud, and you will see all of this right on your phone. We are making sure to build Anaxeos as lightweight and easy-to-handle as possible, to serve the tiniest of our canine friends as well. Track your buddy's daily activity. How much did they run while you jogged along? After training together, ensure enough rest for both of you to recover. Some of us are born to run. Find your friend on the loose before they get in trouble, by following them on a map in near real-time. Seniors hold a special place in our hearts. Life with an ageing dog is sometimes tough, so we'd like to offer some peace of mind. Monitor your friend's heart rate and daily activity to better keep track of their wellbeing. They might misbehave from time to time, but who's to say your buddy doesn't deserve a treat? Have a look at what they've been up to during the day, and remember to reward your whosagoodboye. We hate being away from our dogs almost as much as they hate seeing us go. While you're making your way back home, follow their activities from afar. Finding your daily routines might take a while when new family members join the pack. Get to know their rhythm and start building routines by tracking their days.